Break out the champagne and toast to a year filled with tasty recipes. Keep the party rolling into 2019 by preparing these five delicious and easy grass fed beef dishes. Steak and French fries just belong together. Grill thinly sliced marinated steak bites for 15 minutes. Add fries on top of steak bites, roll up, and secure with a toothpick. Drizzle with steak sauce for added flavour. Doesn’t it always seem like everyone’s gathered around the taco dip at parties? Who can resist crumbled ground beef topped with sour cream, cream cheese, tomatoes, peppers, and gooey cheddar cheese? Make sure there’s enough tortilla chips to go around! Add some pizzazz to your holiday dinner party. This dry rub mixture is nothing short of miraculous. Roast rib eye until golden brown, about 40-50 minutes. Guests will be talking about your delicious roast all night! This mashup of sliders and dip takes skillet dips to the next level! It’s the perfect way to ring in the New Year with friends and family! Wow your friends with this colourful beef appetizer! Tiny peppers packed with ground beef, spinach, and couscous, and sprinkled with cheese. Bake until tender and delicious. Happy New Year from Gemstone Grass Fed Beef! Order everything you need to make your NYE party festive! Shop our online store for premium cuts of grass fed beef. 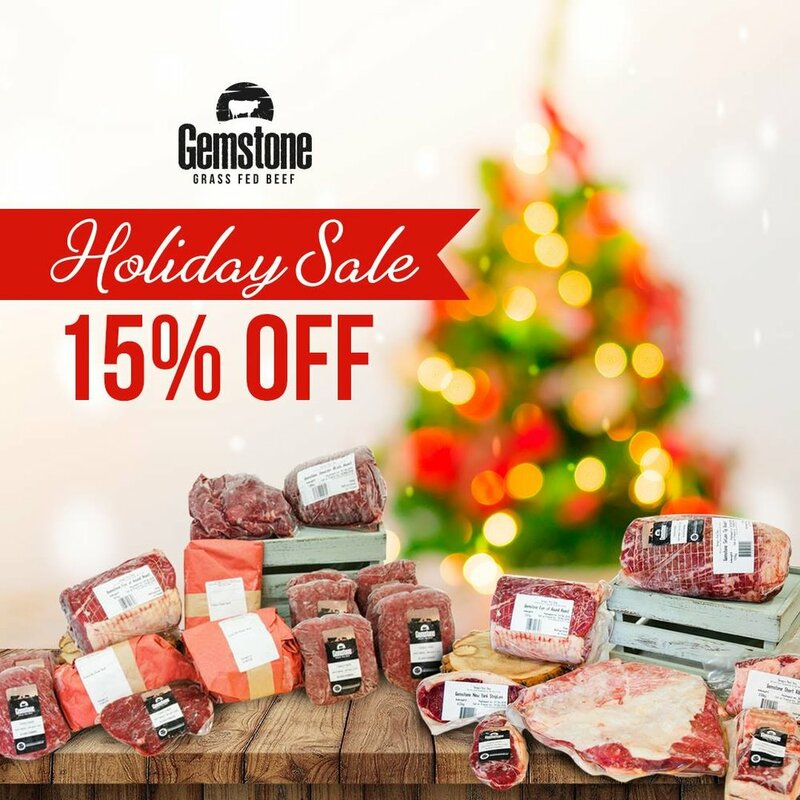 We’re offering 15% off our Beef Staples Box and our Beef Smoker Box! Use promo codes: SMOKER15 & STAPLE15 at checkout!